Happy Valentines Day. Although I know my post is published the following day, I hope everyone had a good day. In comparison to where I live, living in Monterey is nice for weather. Today it was 80 deg here away from the water and in the 60's near it with the wind coming off the ocean. 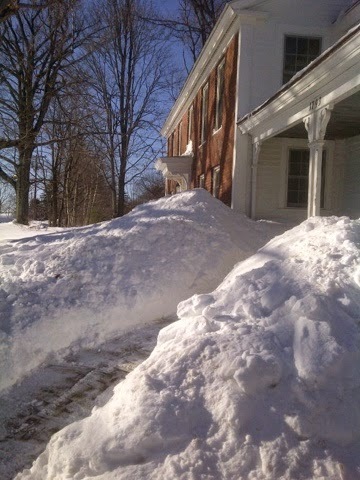 More snow is falling in MA today and 15 deg and more snow tomorrow to add to what is in the picture above. My day started off going with family to gymnastics for my the youngest granddaughter here. 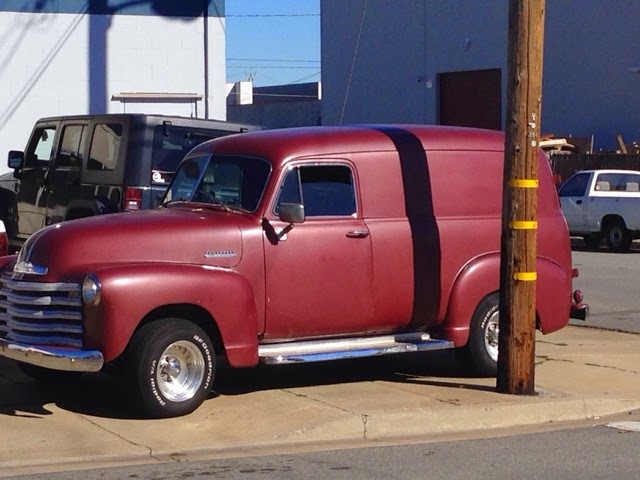 I decided to walk around outside to enjoy the weather and I noticed this old Chevrolet panel van that I thought would make an interesting campervan. There are so many vintage cars in the southwest. The moisture and extreme temperatures along with the winter use of salt on the roads cars rust and never get to live a long life unless garaged. Here I am pleased to see so many older vehicles still on the road. After regrouping at home we all rode bikes to Pacific Grove for a children's birthday party, stopping in Cannery Row in Monterey for lunch. 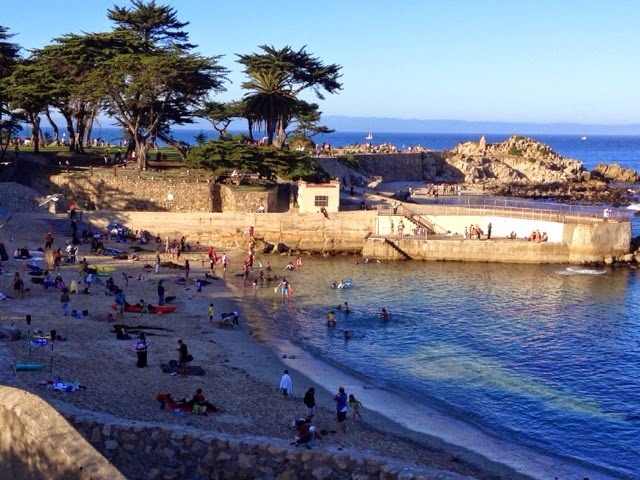 Pacific Grove is one of 3 communities that comprise the Monterey Peninsula. Pebble Beah and Monterey are the others. 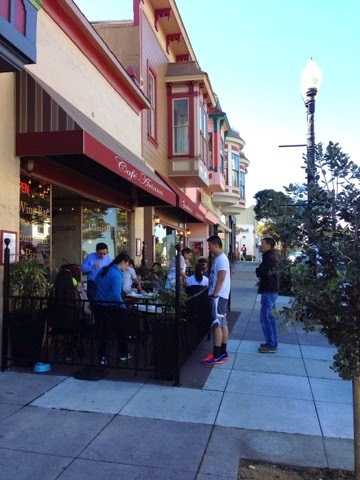 Pacific Grove is quaint with a wide Main Street lined with all speciality shops, including many coffee shops and restaurants. The neighborhoods around Pscific Beach downtown comprise many single and one and a half story cottage style houses. 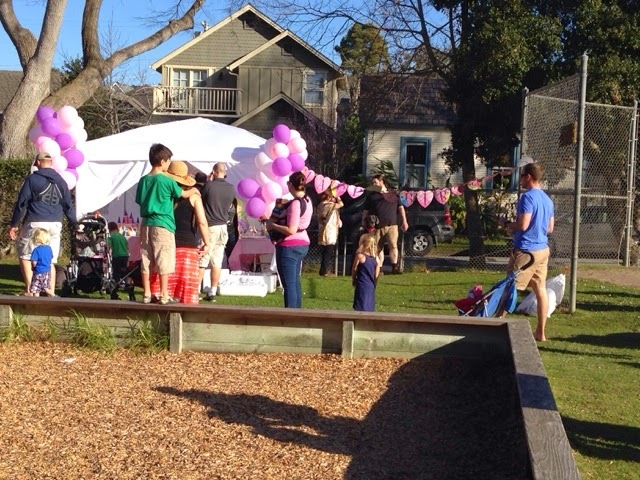 The party was held in a park off the center of town. 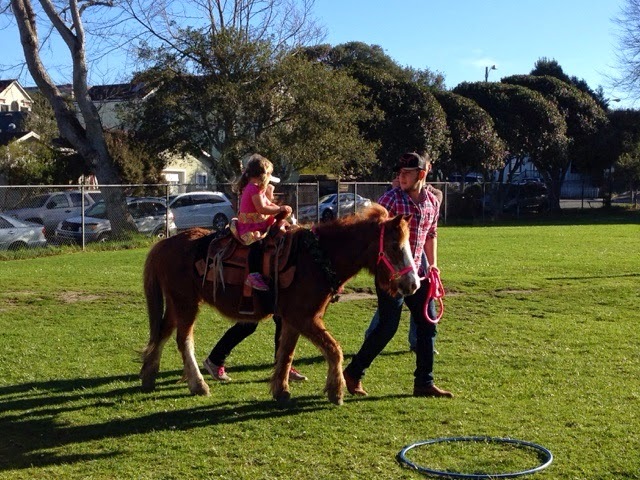 The host had hired pony rides that the children enjoyed. Including my grandchildren. While here at the park waiting for the party festivities to start we met a man and his 4 year old birthday son who had rented a bounce house for his birthday. It didn't appear that he had a formal party with cake, etc., but there were other children around when we got there. The boy's father offered the bounce house to other children including my granddaughters. 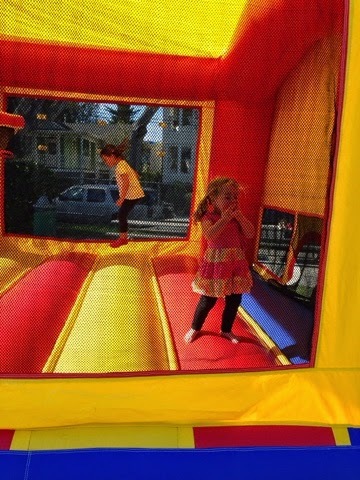 They just love bounce houses! 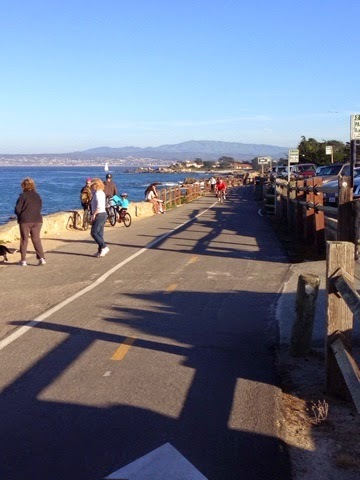 The way home was the way we came, along the multi-purpose trail that sits on Monterey Bay. It used to be a railroad. 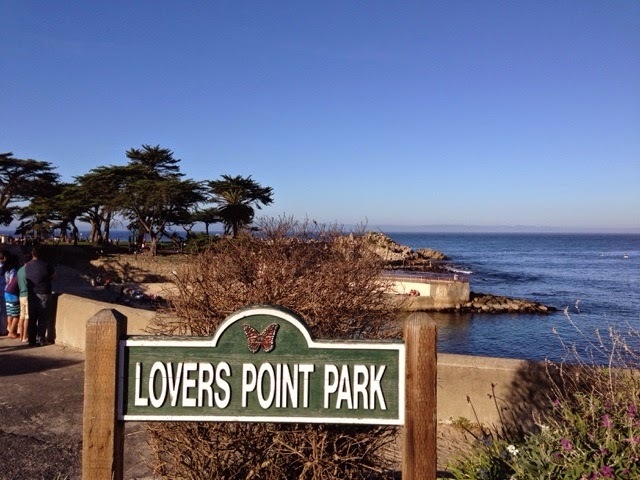 At the end of the trail in Pacific Beach is Lovers Point. There were a lot of couples and families at the point and along the trail enjoying the weather, sights, and each other's company. Some even enjoying the cold water. 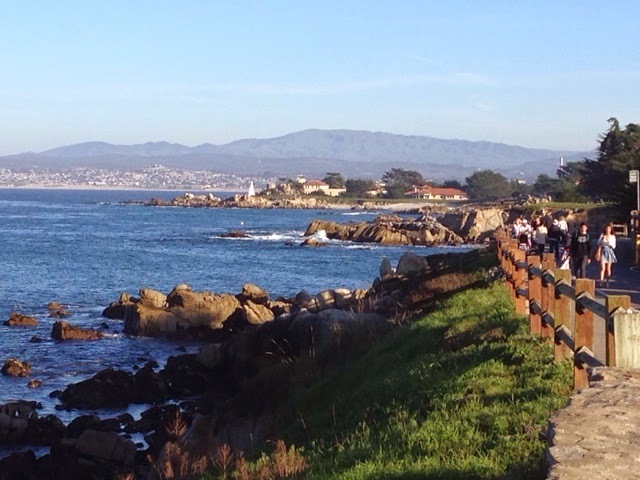 The trail was crowded from all the tourists here for the PGA tournament at Pebble Beach this weekend. Here I look back to Monterey from Pacific Beach along the trail. Our bike ride was just under 11 miles round trip. My oldest granddaughter at 5 years old does a great job riding her Christmas delivered multi-speed bike she got. Her and I did walk up the BIG hill that they live on, while Dad and Mom went ahead. Clayton brings the younger Grandaughter with him on his bike. He has an add-on tandem that hold to the seat post for her but at 3 years old she enjoys the ride and doesn't do much peddling. Last time I came in December I bought a bike at Walmart like the one I bought last year when mine was stolen in Phoenix during my 2014 Travels. I left it here so I have one I can use when I come. It only cost $80 so it is cheaper than renting a bike over a short time and saves the work to go get it when you want it. I do see a new seat in my future. What is it about seat comfort when you get older? 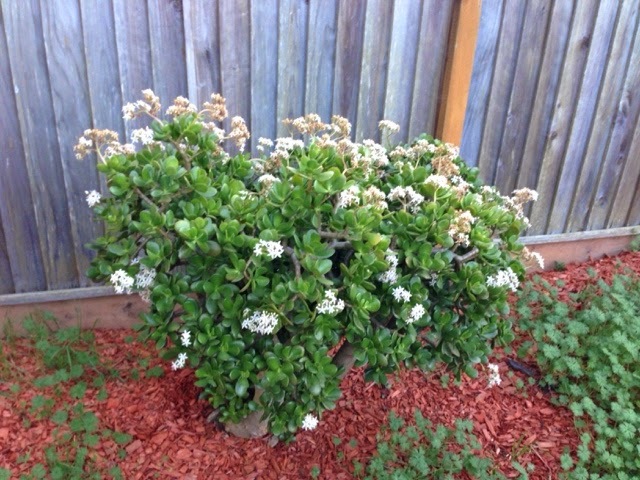 The jade plant in the picture above is in Clayton's yard and it being in bloom gives hope to those in Mass who are snowed in. So here is hope that spring may come one day.